VANCOUVER, British Columbia (AP) — There are the startling goals, the jaw-dropping passes and mind-bending moves. And in just two months, there are the rave reviews. Vancouver Canucks rookie Elias Pettersson is rocketing shots past goalies. He already has 13 goals and eight assists in 20 games, drawing comparisons to some of hockey’s best. Wayne Gretzky recently spoke about Pettersson on a Vancouver radio station, saying he sees similarities in how they both play. Pettersson said being mentioned alongside Gretzky is a great honor, though it’s one he isn’t entirely comfortable with. “I don’t know if anyone should be compared to him because he’s the greatest ever,” he said. In October, Pettersson was named the league’s rookie of the month despite missing two weeks because of concussion from a hit by Florida’s Mike Matheson on Oct. 13. 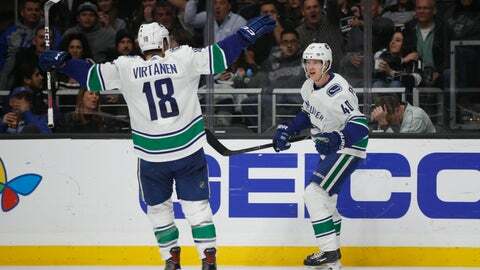 In early November, he became the youngest Canuck to have a five-point game when he helped Vancouver edge Colorado 7-6 in overtime. The 6-foot-2, 176-pound Swede is quiet and humble off the ice. On it, he has shown he is more than an offensive juggernaut. He blocks shots and delivers hard back checks. “I see shades of (former Detroit Red Wing) Pavel Datsyuk and those type of players in him,” Vancouver center Bo Horvat said. “Just his hands, the way he moves out there. Virtanen is struck by Pettersson’s savvy and intelligence. Andrew Calof played with Pettersson on the Vaxjo Lakers in Sweden last year. He says everyone knew right away he was a “special talent” with an insatiable work ethic. “He’s a perfectionist. When he sets his mind to something, he will accomplish it,” Calof wrote in an email to The Canadian Press from Russia, where he plays in the Kontinental Hockey League. He recalls Pettersson’s dedication — constantly watching video and working after practice on shooting and passing. Behind Pettersson, the Lakers captured the Swedish Hockey League championship. He led the league in scoring with 56 points and was the most valuable player. “Whoever was on his line knew they were going to get a couple of extra points that week because Elias would do something crazy and either give you an open net or score a shot that you’re think was impossible,” Calof said. Despite all the acclaim and attention, Pettersson insists he feels no extra pressure. He’s playing hockey and having fun.